Updated: 10:33 pm, Wed Feb 17, 2016. Dustin Erickson works 80 hours a week and attends university full-time. Yet, the 24-year-old isn’t stressed. “In fact, I love it,” said the owner of Float Space, the business with saltwater isolation tanks used for relaxation and well-being. Of course, Erickson owns Float Space, so daily soaks in one of the sensory depravation tanks is convenient and cheap for him. Otherwise, a one-and-a-half-hour session costs $59, or three for $90. Erickson recommends people float at least once a month to reap the benefits. And those benefits are wide-spread and profound. “Floating in the weightless, sound-proof, completely dark (if you want), skin-temperature saltwater chamber brings about a physiological relaxation response you can’t even get with sleep,” explained Erickson. Don’t worry, the saltwater is shallow and super-buoyant, so even if you fall asleep while floating you remain on your back, breathing safely. In fact, Erickson sometimes gets his entire night’s sleep in one of the isolation chambers. The perks of floating linger after exiting the depravation tank with better night’s sleeps, improved circulation, reduced stress, increased flexibility, speeded healing and an elated feeling on emotional, physical and mental levels. Before you think this is too new agey and out there for you, floating is backed by science. 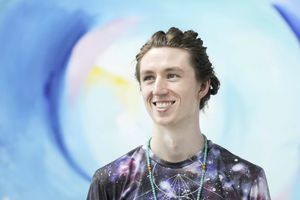 Erickson is a fourth-year biology student at UBC Okanagan and part of the reason he started Float Space was to do research on the benefits of floating. The first study, with 129 volunteer floaters, has been completed and shows that even a single 90-minute float significantly improves well-being and decreases ill-being. During his second year of university, Erickson like half of all undergraduates was stressed. While finding some relief meditating and doing hot yoga, he heard of floating and first tried it at some guy’s garden shed in Surrey. It literally and figuratively changed his life. Erickson quickly got to work on a business plan to open Float Space in Kelowna with help from a float centre in Portland, Community Futures and loans from the Futurepreneur program aimed at youth and Royal Bank. Opening two years ago in the Stewart Centre off Kirschner Road, Float Space is now a going concern. Erickson still enjoys hot yoga, meditation and some skiing and snowboarding, but floating is central to his life. “I’d like to do more research, see floating for medical reasons covered by insurance companies and franchise Float Space across Canada,” said Erickson. Erickson likes to tell the success story of a floater who first arrived after three hip replacements, one which had gone horribly by dislocating her spine from her pelvis. She was miserable, in pain taking morphine and steroids and could hardly move. “Through some regular floating her mobility returned, she has come off most of the drugs and is happy again,” said Erickson.